Coined by the fanatical Evangelical Christian, Captain Arthur Conolly, the "Great Game" was a phrase originally devised to describe the nineteenth-century confrontations and intrigues between Russia and Britain over Central Asia. The term re-entered diplomatic parlance upon the collapse of the USSR when the region found itself propelled to the center of a new power struggle through a combination of its strategic location and the discovery of extensive reserves of oil, gas, and uranium. With 54 nuclear plants currently under construction worldwide and more in the pipeline, demand for uranium has skyrocketed. Kazakhstan is by far the world largest producer of the nuclear fuel, mining 24,575 tonnes in 2016, over half of which was tapped by Kazatomprom. Russia, Japan, China, Canada, and France are all heavily invested, whilst international agreements also exist with India, South Korea, the U.S., and Iran. Mindful of the nation’s days as the Soviet Union’s primary atomic test site, only Kazakhstan's nascent environmental movement has raised any objections to the burgeoning nuclear industry. Between 1949 and 1989, the Soviet authorities executed more than 750 nuclear tests in Kazakhstan, the bulk of these - including the USSR’s first successful atomic explosion - taking place in the Semipalatinsk Polygon (a closed zone, also known as Semipalatinsk-21) in the north-east of the country. By far the hardest hit area, Semipalatinsk saw 456 tests, which affected two million people across three hundred square kilometers. Today, with all agriculture banned, a vast swathe of land still remains off-limits. Even in inhabited areas, Geiger counters read over 250; the normal level is just 15. In this post-apocalyptic landscape, elevated levels of cancer, tuberculosis and mental illness persist. All pregnancies are still screened for possible termination, six percent of babies born "polygon." In their headlong rush to abandon the empire upon the collapse of the union, the Russians left more than undetonated payloads in the mines of Semipalatinsk. Upon its birth as a nation, Kazakhstan inherited the fourth largest nuclear arsenal in the world. With Libya’s Colonel Gaddafi sniffing around, it was widely rumored that the Iranians, who the CIA publically alleged to be "actively shopping," had offered three hundred million dollars for weapons-grade uranium. Arriving in Kazakhstan post-haste, through a combination of threats, the promise of a seat at the international table and hard cash, U.S. Secretary of State James Baker persuaded President Nazarbayev to give up Kazakhstan’s cache, which the Americans duly dismantled and disposed of. Mukhtar Dzhakishev graduated from the Institute of Physics and Engineering in Moscow in 1996, where he’d studied alongside his close friend, Mukhtar Ablyazov. From 1992 to 1998, Dzhakishevworked his way up through the ranks of Butya and Alautransgaz, oil, gas and mining companies, before being named as head of Kazatomprom.In 2001, he briefly left the post to become Deputy Minister of Energy and Mineral Resources, serving under Ablyazov adjoining his colleague’s extreme capitalist Free Democratic Choice of Kazakhstan movement, before exiting the political arena to resume his role at Kazatomprom in 2002. Part of a new generation recruited by Nazarbayev, for over a decade, Dzhakishev oversaw the uranium rush, turning a near-bankrupt state concern into a growing business concern with soaring profits. Signing deals around the world, "it’s been honeymoon, honeymoon, honeymoon," he said of the sector’s rise. The honeymoon ended abruptly, however. In April 2009, Kazakh parliamentarian Tatyana Kvyatkovskaya accused Dzhakishev of siphoning uranium money into offshore accounts. Mines ended up in the hands of numerous foreign investors, some through groups headed by Ablyazov, who’d already fled the country and stands accused of embezzling up to $10 billion. 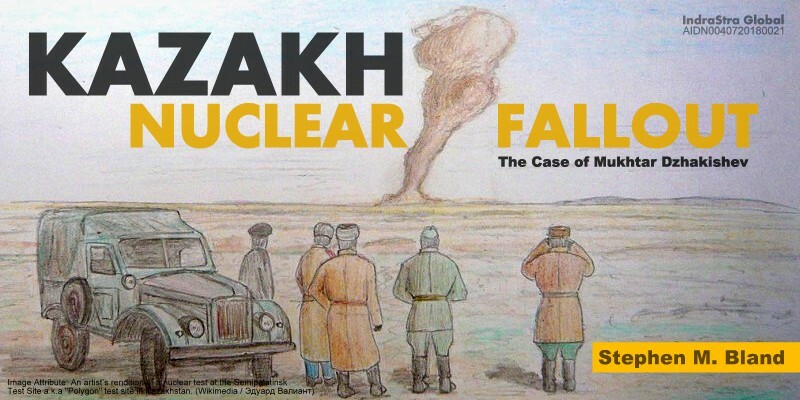 On May 21st, 2009, Dzhakishev was arrested before he could join his associate in exile, the National Security Committee alleging that he’d appropriated 60% of Kazakhstan's uranium deposits, worth tens of billions of dollars. In March 2010, Dzhakishev was sentenced in a closed trial to 14 years in a high-security penitentiary¸ Dolinka AK-159/6, near a Soviet labor camp where dissident writer Alexander Solzhenitsyn was imprisoned in the 1940s, an ordeal detailed in The Gulag Archipelago. The formal charges against Dzhakishev amounted to only $670,000, a fraction of the total amount asset-stripped from Kazatomprom. Subsequently found guilty on separate charges related to embezzlement, fraud, involvement in organized crime and the abuse of power, he was sentenced to a further ten years to run concurrent to his prior sentence. In an extraordinary series of leaked videos of interviews with KNB investigators shortly before his sentencing, Dzhakishev left no doubt as to whom he blamed for his downfall. "I've had plenty of time to think over the situation, and I've been trying to figure out who benefits from it," he said. "I came to the conclusion that it plays into the hands of the Russians [who want to keep Kazakhstan as a] raw materials appendage." Prior to his arrest, Dzhakishev had penned numerous deals giving foreign firms access to uranium mines, which in turn made Kazakhstan less dependent on Russia. One of these was with Canadian mining giant, Cameco, the world’s second-largest producer of the nuclear fuel. No stranger to controversy in the region, Cameco had already been running the Kumtor Mine in neighboring Kyrgyzstan since 1992 in a deal brokered by Boris Birshtein’s Seabeco. A man of frequently changing nationalities, Birshtein infamously hosted a meeting of the world’s top mafia dons in Tel Aviv in 1995 at which Semyon Mogilevich, a long-term member of the FBI’s top ten most wanted list was present. Seabeco was named in a Kyrgyz court case for the embezzlement of $23 million. Deeming the agreement with Cameco "not in the nation’s interests," the Kyrgyz Parliament has been fighting to annul it ever since. Another Canadian businessman, Frank Giustra was also eager to get in on the uranium boom and had put together a team which included Ian Telfer, the Russian Sergey Kurzin, and Canaccord Capital. Giustra formed UrAsia Energy Ltd, buying a 70% stake in mines in Akdala and South Inkay from a shell company by the name of Betpak Dala, and a 30% stake in a Kyzylkum deposit for a total of $425 million. Shares in these companies had been taken out of state control as collateral in a loan agreement with BTA Bank that was never meant to be repaid and placed into the hands of BTA Chairman Mukhtar Ablyazov. A man found to have committed "fraud on an epic scale," Ablyazov is subject to judgments totaling $4.9 billion in the British courts alone. Investigating the deal which had seen Betpak Dala gain majority ownership in Akdala and South Inkay, in April 2009 Kazakh parliamentarian Tatyana Kvyatkovskaya found that just $426 dollars had been paid for the assets, which were then sold for $350 million. According to a WikiLeaks cable out of Astana dated June 3rd, 2009, "Dzhakishev collaborated with former BTA bank chairman Mukhtar Ablyazov to sell state shares in key uranium mines such as Akdala, South Inkay, and Khorasan ‘for nothing.’"
In February 2007, Giustra sold UrAsia for $3.1 billion to Uranium One - a company based out of Toronto - turning a profit of over $2.6 billion. Whilst the Twitter campaign in support of Mukhtar Dzhakishev: "businessman, philanthropist, Kazakh patriot, husband, and father" may be long since defunct, as is the dzhakishev.org website, NGOs such as Freedom House and Human Rights Watch (HRW) haven’t forgotten about the case ofDzhakishev. On the 16th, April 2018, the Kazakh Government hosted foreign guests, including European parliamentarians, Human Rights activists and journalists to an event in Almaty addressing the state of justice in the republic. Responding to Mr. Święcicki’s concerns, Deputy Attorney General, Kenenbayev Yerlik countered that Dzhakishev had been denied the lawyers he requested because they were not privy to the "highly secret" information involved in the case. His request for trial by jury was not met because, under Kazakh law, trial by jury only applies to cases of "high gravity," whereas Dzhakishev’s crimes had been classified as "great crimes." The defendant’s complaint had been reviewed by the Supreme Court and rejected. This decision is open to appeal, however, "Mr. Dzhakishev has not applied any appeal to review the decision… [He] has been transferred to receive private medical care of his own choosing ten times in the last year. His condition is now satisfactory and does not impede the fulfillment of his sentence." There had been no infringement of the U.N. Convention on Human Rights, Deputy Minister of the Interior, Rashid Zhakupov stated, as Dzhakishev was "quite often given the chance to see his relatives, as well as members of NGOs, the Social Commission and Human Rights organizations of Kazakhstan." Since his arrest in Kazakhstan, three deputies at Kazatomprom have turned state’s evidence against Dzhakishev, whilst in 2012 another former deputy, Rustem Tursunbayev was arrested in Canada on charges of embezzlement. The Canadian Press reported that Tursunbayev had been living a "lavish" lifestyle far beyond his declared means. The closed nature of Dzhakishev’s two trials, though, allow doubts to linger. Stephen M. Bland is a freelance journalist, author and travel writer specializing in Central Asia, the Caucasus and South-East Asia, Mr. Bland's articles have appeared in numerous publications including Vice, Registan, Motherboard, and Eurasianet. You can view a selection at www.stephenmbland.com. He regularly tweets at @stephenmbland.